The Shuttle Carrier Aircraft carrying shuttle Endeavour to Los Angeles comes to a stop on the runway at Ellington Field, Houston, TX, on September 19, 2012. Endeavour took off atop its carrier plane, called the Shuttle Carrier Aircraft, from NASA's Kennedy Space Center in Cape Canaveral, Fla., at about 7:22 a.m. EDT (1122 GMT). They flew a victory lap over Florida's Space Coast before turning west for the trip to Houston. Kelly spoke from Tucson, Ariz., where he lives with wife and former congresswoman Gabrielle Giffords, adding that he hopes the pilots ferrying Endeavour across the country will pass over Tucson on its way west this week. Kelly retired from NASA's astronaut corps and the U.S. Navy last year and hopes to watch Endeavour parade through the streets of Los Angeles next month on its way to the California Science Center. Endeavour is NASA's youngest space shuttle and made its first flight in 1992. The shuttle was built as a replacement for Challenger, the orbiter that was destroyed in a tragic fatal accident just after launch in January 1986. During its career, Endeavour launched on 25 missions and flew 122.8 million miles (197 million kilometers) during its spaceflight career. The shuttle soared over NASA's Stennis Space Center in Mississippi (where shuttle engines were tested) and the Michoud Assembly Facility in New Orleans (which built the shuttle external tanks) before arriving in Houston, the home of Johnson Space Center, which houses the agency's astronaut training and mission control centers. In Houston, a crowd of onlookers were shown eagerly awaiting Endeavour's arrival as the U.S. national anthem and other patriotic songs blared over a loudspeaker. A crowd awaits space shuttle Endeavour at Johnson Space Center, Houston, TX, on September 19, 2012. In Houston, Endeavour and its carrier plane landed at Ellington Field, which NASA uses as a base for its T-38 astronaut training jets. The shuttle will stay for one day, resuming its trek to California on Thursday (Sept. 20) at about 7 a.m. CDT (8 a.m. EDT/1200 GMT). The shuttle will make a refueling stop at Biggs Army Air Field in El Paso, Texas, and then head to NASA's Dryden Flight Research Center in Southern California to end its second day of travel. On the way, it is expected to pass over White Sands Test Facility near Las Cruces, N.M., a backup shuttle landing site. Dryden officials will broadcast the shuttle's arrival live on NASA TV and in a NASA webcast. Endeavour and its carrier aircraft are expected to land at Dryden at about mid-day local Pacific Daylight Time. Friday, Sept. 21, is L.A. arrival day for Endeavour. Endeavour and its carrier aircraft will take off early in the morning (Dryden will broadcast the departure live on NASA TV), and then fly north to perform flyovers above California's capitol city Sacramento, and later San Francisco, before returning south for a mid-day arrival local Pacific Daylight Time at Los Angeles International Airport. Endeavour is just the latest NASA space shuttle to head off toward a new museum home this year. 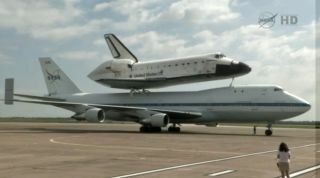 NASA picked the four museums to receive its precious shuttles for public display in April 2011. In April of this year, the Discovery orbiter — NASA's most traveled space shuttle — was delivered to the Smithsonian Air and Space Museum for display at the museum's Stephen F. Udvar-Hazy Center annex in Chantilly, Va. In the months that followed, the space shuttle Enterprise, a prototype orbiter used for landing tests only, was delivered to New York City, where it is now on display at the Intrepid Sea, Air and Space Museum in Manhattan. Endeavour's display at the California Science Center will open in October. The shuttle will be towed from Los Angeles International Airport to the science center during a two-day drive that will end on Oct. 13. The space shuttle Atlantis will be displayed at the Kennedy Space Center Visitors Center. It is expected to be towed to the Visitors Center from the nearby Kennedy Space Center on Nov. 2. Its exhibit is scheduled to open in 2013 over the Fourth of July weekend. NASA retired its space shuttle fleet in 2011 after 135 missions and 30 years of service. The space agency currently plans to rely on commercial spacecraft to ferry astronauts into and from low-Earth orbit as it develops new space vehicles and rockets for deep-space exploration. Share your photos of the ferry flight with SPACE.com and partner collectSPACE.com! Send in your snapshots of Endeavour atop the Shuttle Carrier Aircraft to SPACE.com managing editor Tariq Malik at tmalik@space.com and collectSPACE.com at contact@collectSPACE.com.